The stones show the point on the horizon where the sun rises at the spring and autumn equinoxes. 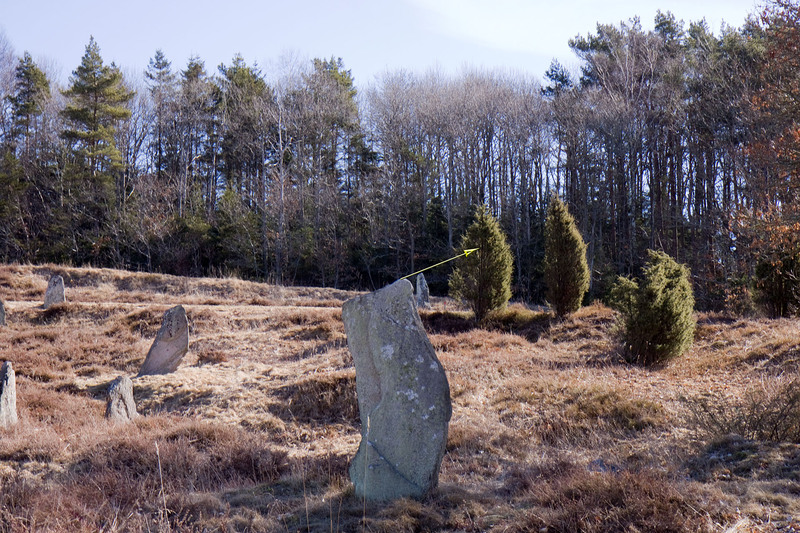 The distance between the stones is 31 m.
The animation show 1) Vernal and Autumnal equinox (Heigth model equinox), samt 2) the day before the Vernal equinox and the day after the Autumnal equinox (Refraction equinox). See definitions under Calendar days. The gradients of the top of the stones are in good alignment with the sun’s path. Notice that the sun’s path is exactly right the day before the spring equinox and the day after the autumnal equinox (“refraction equinox”). It is these days that day and night are of equal length. Forest obscures the sun at sun rise.